Notes: Location is currently slated for demolition in December of 2015. Sitting to the south west of Lewistown is the little village of Granville. There is a retirement community in a large 4 story building called the Malta home, home to about 40 residents. This grand building apparently started out being made for a slightly different purpose This location was used as a home for the retired, the widowed and the orphaned by the Knights of Malta. It was not until the 1960's that it was sold to the current owners and changed to a retirement house. Plans for the house started as early as 1907. with land being purchased in 1909. A ground breaking ceremony was held in 1918 , with the cornerstone being set in 1919. May of 1921 the Home was ready to receive the first retired Maltas and Malta Widows and Orphans. The home was dedicated on August 13, 1921. Malta Home grew until the property contained a fully equipped dairy farm, with a large stone barn, a brick school and recreation park. In 1944, the last of the orphans moved away and in 1956 the Home was opened to aged non-members. The Knights sold the property in the mid 1960 and donated the park to the community. A series of remodeling were done by the new owner on the inside to modernize the interior. On November 24, 1995, the school was raised. long ago or the activity of the residents of long ago who never chose to leave. This could also be that not all the floors have been remodeled. bodies in the attic. Their spirits are supposed to be able to be hard moaning and seen roaming the grounds. This may be a little hard to prove as the house was not built then. There is however reported murder that fit’s the murder story not too far away in Academia in a girls school. This story may be a bit garbled with time and sort of meshed together. 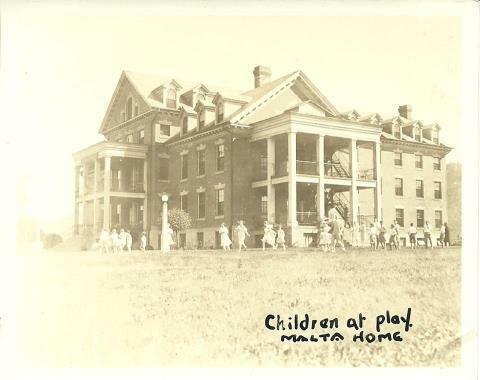 There are also reports that are more believable that there was an outbreak of disease that may have killed off many orphans when it was open, being the cause of the haunting at the Malta Home. A little girl has been reported to play on the second floor. There are reports of children running around the third floor as well. A woman in red has been seen throughout the building. One ex-Nurse we spoke to mentioned she was sitting at the second story station doing paperwork. We noticed out of the corner of her eye that a lady in a red dress walked by and down the east wing and into a patient's room. It just being at the end of visiting hours, the nurse went down to let the woman know and to keep the visit short. She went to the room the lady in red went into, and it was empty, with no other way in or out except the hallway door. When it was a boy’s orphanage, part of the duties of the boys was to work the attached farm and orchard. There was a tunnel from the orphanage building to the farmhouse that may still exist, but may be blocked off . This tunnel serverd no nefarious purpose, as it was part of the heating system. We often come across this type of tunnel when in buildings from this time period. There was also resident of the retirement home who had a unique claim to fame. Not only was she living in the retirement home in modern times, she was also a resident of the orphanage many years ago. Sadly she passed away a few years ago. One could only imagine the stories she could have told. We hope to be able to track down a relative to see if she passed any of those stories down.